Here are our favorite reasons for families from all around to check out our state-of-the-art swim facility. We know how important the right environment is to teaching your child how to swim- and we spent years researching how to do just that! Our pool is heated to 90 degrees, we have the BEST UV Filtration System available, and we offer a Family Friendly Changing Area so that anyone can feel comfortable both in and out of the water! Our facility is brighter, our staff is friendlier, and our pool is cleaner than any around. Our facility is also equipped with acoustic banners that are draped throughout the open ceiling in the pool area. The banners effectively reduce the sound reverberation and enhance its sound absorption. The banners are mechanically fastened to the ceiling in the pool area and pulled taut to the ceiling to remain out of harm’s way. You will notice with multiple classes and many students in the pool area at once it will seem much quieter. All students and parents will be able to hear the important instruction from our teachers with ease! (Remember that UV Filtration System? It kills 99.9% of germs while providing new, fresh, drinking-quality water every 90 minutes!). At Barron Swim School, we take the time to fully train and certify each and every one of our teachers. The safety and comfort of your child is extremely important to us, and we wouldn’t have it any other way! You’ll see friendly, smiling faces every time you walk through our doors- not to mention the best swim teachers for miles around! Our curriculum was designed exclusively by swim experts and has been personalized to match our mission: Building Skills for Life. We use soft, skill-oriented teaching techniques while focusing on progression and building life-long ability in the water. We offer a small 4:1 ratio to give each child the same opportunity to learn life-saving skills at their own pace. We keep our classes small for good reason- class management and personalized instruction. Our teachers make sure each child gets the attention they need to excel in the water! Our 4:1 ratio ensures your child will get exactly what they need out of each class- while staying safe and comfortable. 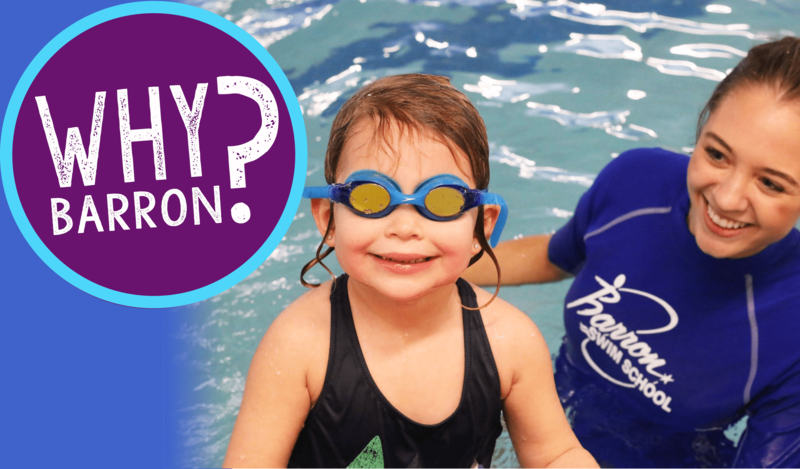 Our mission at Barron Swim School is to motivate and fascinate children in fitness and learning, to give each child a chance to be noticed, to enrich self-worth and self-esteem, to create a safe and positive environment, and to Build Skills for Life! Enroll in class today. With reasons like these, spots are filling up fast!